A note from Candy: I was truly wowed by the last book I read by Nicky Singer - Knight Crew, a retelling of the Arthur-Guinevere romance set in a gritty council estate and populated by heart-breaking teenagers. When Knight Crew came out, Nicky actively urged readers not to buy the book from Amazon. 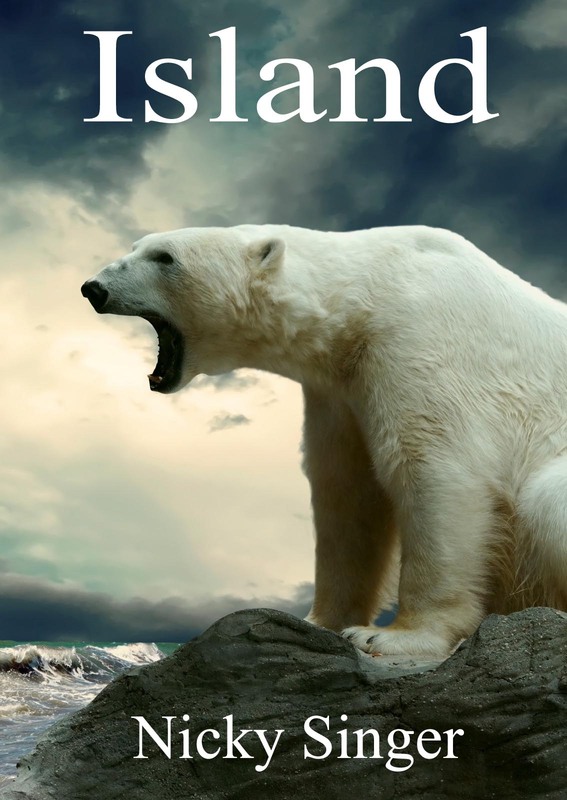 Last week I stumbled on Nicky's Kickstarter campaign to publish her play, Island, as a novel. I backed it right away, of course. I invited Nicky to tell us the story behind the Kickstarter - yes, selfishly, I'm hoping this will persuade everyone else to back the book - I WANT TO READ THAT BOOK. But it won't be published unless more people know about its potential brilliance. 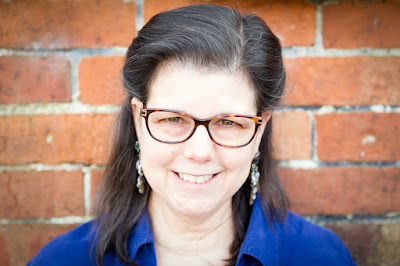 What led Nicky, an accomplished, award-winning author, to seeking this alternative route to publication is a testament to the blistering changes that have transformed Publishing. Support Nicky's Kickstarter Campaign here. My new novel Island is, apparently, a ‘quiet’ book. In its previous incarnation, as a play at the National Theatre, it was quite a noisy thing. It played to sell-out audiences in the Cottesloe, did a thirty-school London tour and enjoyed a raft of four-star reviews. 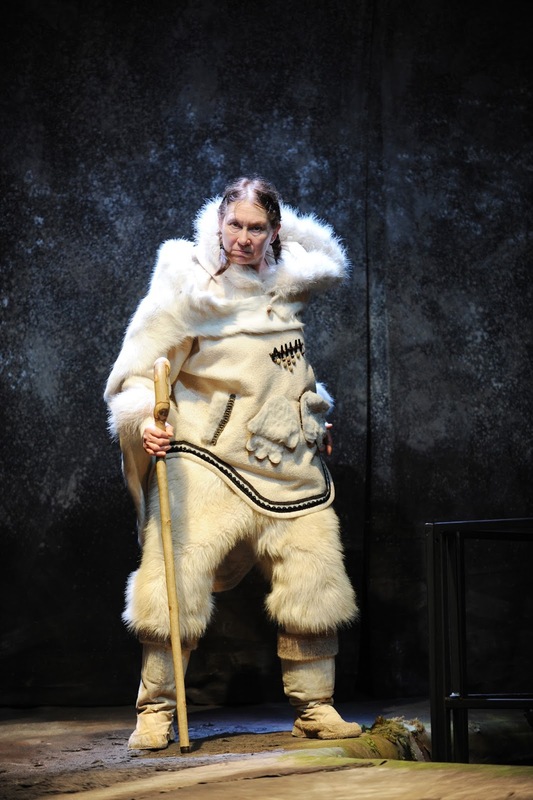 From Island, the National Theatre Production. 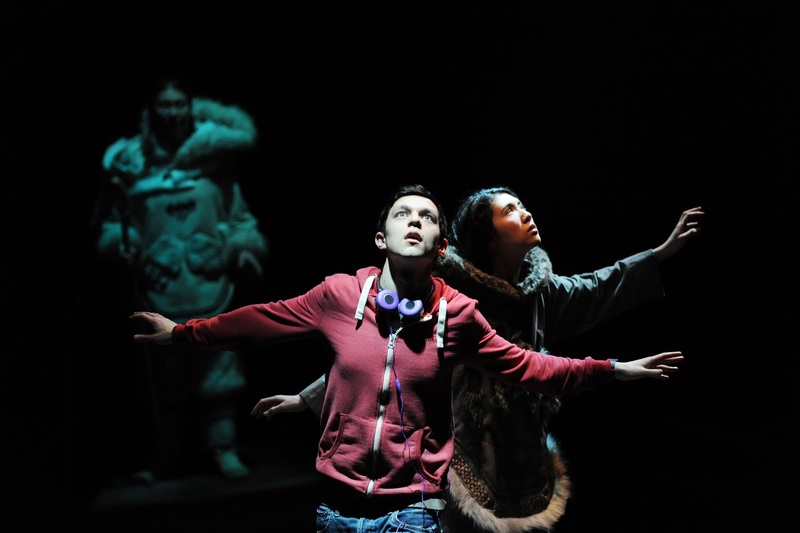 The National Theatre’s terrific new play for over-eights is set on what we call Herschel Island in Northern Canada (the Inuit have another, much older name for it). The one-hour play explores the impact of global warming – think Frozen Planet brought to life for children with characters the audience identify with and care about. 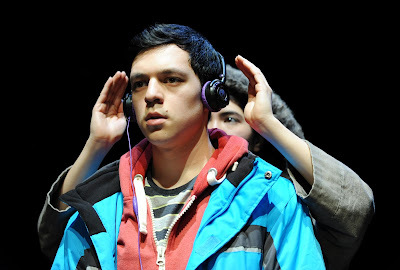 Island explores the conflict between scientific and metaphysical truth, colonialism, the exploitation of other people’s environment, the role of religion and the power of storytelling. So it isn’t short of issues for children to think about afterwards, but at the same time it avoids any sense of worthiness and stands up well as a piece of compelling, moving drama. I never planned to re-write it as a novel but I failed to factor in the speed of the melting ice-caps. 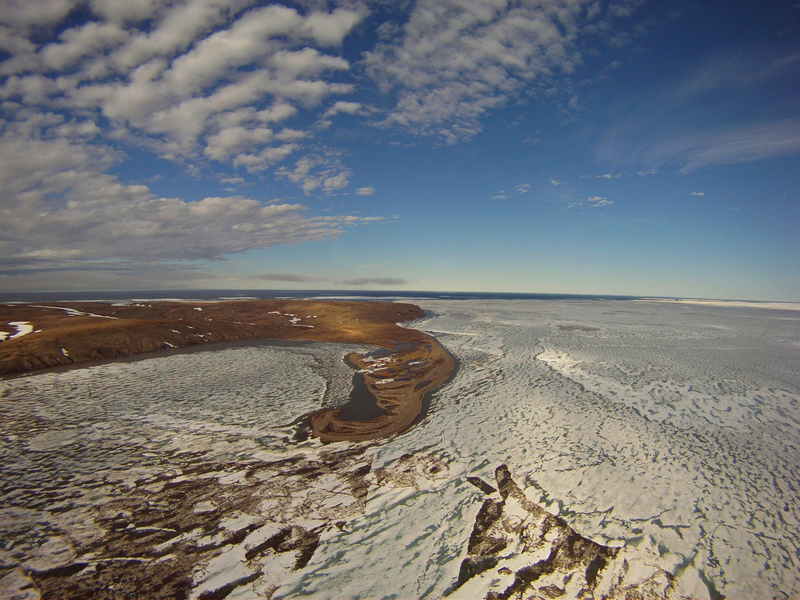 The book is set in Herschel Island in Northern Canada. Five people rang me up in the same week: our young people need that story more than ever, they said. Don't you understand? They have to have the chance to engage with what’s going on in the arctic. Do it. Do it now! So I did. And I fell in love with my characters (a grumpy Western boy, a local island girl, an ice bear) all over again. I liked the extra space in the book. My day-job is as a novelist. I believed I made a pretty good fist of the re-write. In fact, I rather thought the last 100 pages were some of the best I’d ever written. My long-term publisher disagreed. ‘It’s too quiet,’ they said, ‘for the current market’. I’m not sure this particular publishing term has made the OED yet but, roughly translated, I think it means: ‘this book will not make a shed-load of money’. Leaving aside the fact that, if publishers really knew what makes a shed-load of money, eight of them wouldn’t have turned down Harry Potter, I think, in Island’s case, they are probably right. Island is not a fast-paced Boys Own Adventure Story (this is apparently the current market approved fad) but an adventure of a rather different kind – one that takes you (like the Inuit) travelling in dreams. Besides, being quiet isn’t Island’s only sin. It is also, apparently, ‘too literary’ for the current climate. We’ll come back to that. But let’s start with the money. When I published my first novel (an adult title To Still the Child ) in 1992, I met my editor, and also the Managing Director of the company. These were the people in charge. If the company had a publicist I didn’t meet him/her. I didn’t meet anyone from sales. Nowadays, it’s all rather different. Small teams of editorial staff have to ‘pitch’ ideas to the marketing people. Lots and lots and LOTS of marketing people. Then the marketing people decide whether the title will – or won’t - make a Shed-Load of Money. For publishing is no longer some Gentlepersons Club full of bookish folk. Of course not. It’s a Global Business. So – fair enough about the money. Right? Well – yes and no. As Ursula Le Guin put it, in her blistering address to the US National Book Awards last year there is a difference between ‘the production of a market commodity and the practice of an art’. She goes on to wonder at us – the writers and creators - ‘who let profiteers sell us like deodorant and tell us what to publish and what to write’. She finishes by demanding, not shed-loads of money – but freedom. What might this freedom look like for someone like me? To be able to publish a powerful, meaningful story in powerful, meaningful language. For young people. Yes – young people. ‘Too literary’ you see, appears to mean the language I use is (to use current publishing jargon) a little ‘tricky’ for these apparently lesser mortals. I’ll give you an example. I was asked to take the word ‘bonnet’ out of my last novel, The Flask, on the basis that no self-respecting 12 year old would know such a word. The publisher was unmoved by my assertion that, at the same age, I was required to be able to spell and define words like ‘sinecure’. Does this matter? I think so. 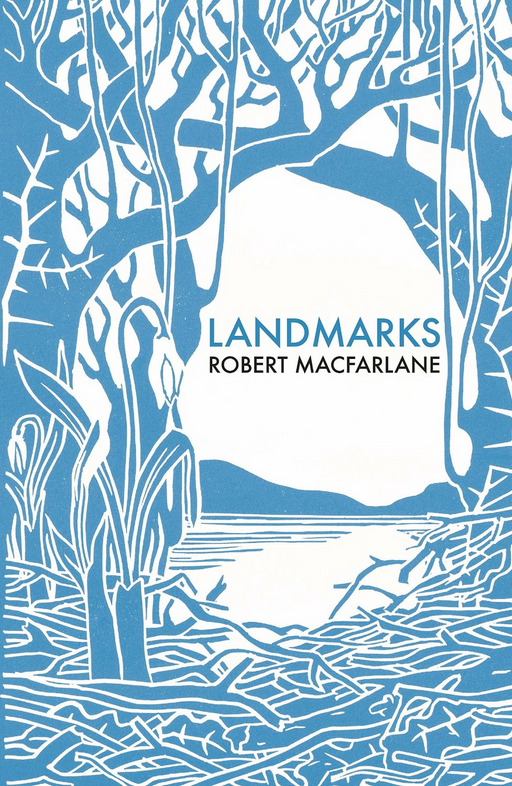 Robert MacFarlane has just written a whole book – the wonderful Landmarks - about what the fading away of nature words means to our appreciation and understanding of the natural world. Because, quite simply, we think in language. It there isn’t a word for something, or that word is not in our vocabulary, it impairs our ability to know - and also to communicate. And no, Beatrix Potter would not get away with soporific today. She might even have trouble with lettuce. So what do you do when you book is too quiet and too literary for your long-term publisher? Try a new publisher, of course. Only that’s not quite so simple these days either. Because of Branding. Yes – how is New Publisher to position you in the market if you are so closely associated with Old Publisher? Branding costs, you see. Shed-Loads of Money. And this book, although it’s a great book and beautifully written (we did mention that, didn’t we?) is just a little too quiet for the market right now. This is the juncture when your agent is running out of patience and you are running out of cornflakes. It seemed to me that I had three options: 1) lie down and die (only I’m not very good at that) 2) lie down and die (I seriously considered it) 3) put up or shut up. I decided on 3) and began exploring crowdfunding platforms. Crowdfunding is not to be confused with vanity publishing – although many people do confuse them. Crowdfunding is actually more akin to eighteenth century subscription publishing. Vis you would find out how many friends and family wanted to buy your new collection of poetry, ask for money upfront and print the relevant number of copies. Only now – with the internet, the concept has the potential (emphasise potential) for global reach. Enter Kickstarter. One of several on-line platforms where you can hawk your creative wares. I did some homework (not least with a friend of mine who raised £10,000 to make a film about the plight of illegitimate children in Morocco which the BBC had turned down) and, just over a week ago, launched my first Kickstarter campaign. The experience has been hideous and exhilarating in equal measure. Feeling a failure. Because good books (and – some - really good books) are still conventionally published. If Island was really good, quiet or not, they would have published it – wouldn’t they? Feeling let down by my publisher (who I really like) and feeling that I was letting down my (top flight) agent (who I really like). Having to self-promote. Talk oneself up. Puff oneself. Again and again and again. I’m probably more naturally bullish than the average Brit. But even so. It’s humiliating. Asking people for money. Ditto. Giving five months of my life to things I’m no good at eg mailchimping/box filling/video making. Giving five months of my life to anything that isn’t actually writing. Having to get to grips with technology, in particular social media. The fact that, even if I reach my target, I will not be paid. Not for writing the book. Not for running the campaign. The money will simply cover production and distribution costs. The incredible generosity and support of my friends and family. The first time a total stranger pledged on Kickstarter and told me why. The day that legendary writer Geraldine McCaughrean (The White Darkness is a long-term favourite of mine) lent personal support with an unasked-for donation. The fact that, thanks to Kickstarter (supposing I reach my target) I will be sending books not just to the UK but to Canada (the home of the story) and America and Holland. The real sense of community around the issues of the Arctic and children’s literature. Being offered jobs! A composer getting in touch to invite me to speak on a panel, a dance organisation asking me to share in a creative project. The sense of power. Taking control of the means of production. Putting my money where my mouth is. The sense of relief. I can never really move on to a new project if there’s an old one still in my in-tray. Or brain. This is the first time I’ve laid this out as a list. Looks like – on balance – the good outweighs the evil on all fronts. Except the money one. How artists make a living in ‘the current climate’ – well, perhaps someone else would like to blog about that. Meanwhile - would I do it again? Well, there’s still a long way to go in this campaign before I know the answer to that. The way Kickstarter works is that no money is paid out unless the project realises 100% of the target amount. In a just over a week I’ve raised slightly shy of £2,500. That’s pretty humbling. On the other hand, this is the ‘easy money’ (those incredibly supportive friends). For the crucial additional £3,000 I need to reach out and touch the wider community. People I don’t actually know. People prepared to take risks. People who Venn diagram caring about the planet with caring about literature for young people. If we do meet the target, the physical production of the book will be overseen by Charles Boyle of the award-winning – but tiny – independent press cbEditions. 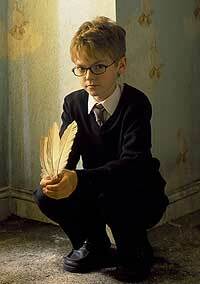 He wants me to come up with an imprint name and I was going to choose ‘Firebird Books’ – partly because the firebird story was so important in my book Feather Boy and partly because it suggests rising from the ashes. But I’ve changed my mind. I’m going to call it Slow Books. Like Slow Food, and even Slow TV now, Slow Books will be about those quiet, deep things beneath the current market shout of the world. And I have this quiet dream that, one day, Slow Books will gather together writers from all over the world with such stories to tell. And then, maybe, there will be whole shelves of Slow Books. And people who care about such things will walk past the glittery branded covers knowing that, on the Slow Books shelf, they will find something worth dreaming about. What are you waiting for? Kickstarter is the new Pre-order. Let's support Nicky's Kickstarter. Go. If you were interested in the issues raised by this article, you should go read Crowded House: Why I Crowdfunded My Book by Alice Jolly on her experience raising £10,000 to publish Dead Babies and Seaside Towns with Unbound. Also this interview with the inspirational Sarah Towle on the Kickstarting of her history app. Very, VERY best of luck. Just off to Twitter to spread the word. Thanks a million, Rowena! And thank you to Nicky. I really hope people will flock to support your Kickstarter because I want to read that book! A compelling article - I've pledged on the strength of it! My first involvement with a kickstarter. Wish there were more "quiet" books for children. Good luck. If there's enough of a groundswell there WILL be more Slow Books. Thank you very much, Sue. Brilliant. I love Slow Books - we need a badge for that. Nicky, this is such a wonderful, blistering piece! I love the deep quiet things that can mean so much and I'm off to support you NOW. If the story has already proven itself as a successful play, I don't understand why your publisher doubts it would work as a book. But you've convinced me, so I've just made my pledge. Good luck with it! More power to your elbow on the kickstarter campaign. I'm about to share this on FB. So much is resonating with me! Great piece, thank you. Nicky, I love the passion that oozes from this post, just as it does in everything you write! This deserves to be out there in book form, to be discovered by many readers who will no doubt fall in love with your characters just as you did. Good luck - I've pledged and shared. I have a blog - a bit of a 'quiet blog' admittedly! and would like to 're-blog' this piece. How can I do that? Lordy - that would be a question for Candy because, as you know, I don't really do this social medya stuff. But maybe just cut and paste link???? But how wonderful you want to share. Thank You nxx ps all power to your quiet blog. A bit late to this post but wanted to say best of luck to Nicky. I find it shocking that a writer of your calibre is not being published and thank you for saying the unsayable. The intelligent children's/ YA novel is as endangered as the Polar bear. the ironic thing is that 90% of the novels they are publishing will sink like so many stones, so they might as well publish quality stuff and be done. 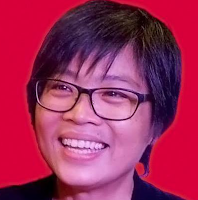 Maybe an enterprising publisher will wake up to this sometime soon, then Nicky, and writers like her, won't have to raise money to publish their books. It is time to turn the tide. Thanks, Celia. I agree. I wish times were different. Hey - I only just saw this, Celia. Thanks SO much. My next endeavour will be a conference to discuss same..... Watch this space.